Stretch marks occur when skin tears due to excessive forces upon the skin. The process of pregnancy, weight gain, and growth spurts can cause stretch marks. Steroid and hormonal changes can also weaken the bonds between the cells of the skin and produce stretch marks. 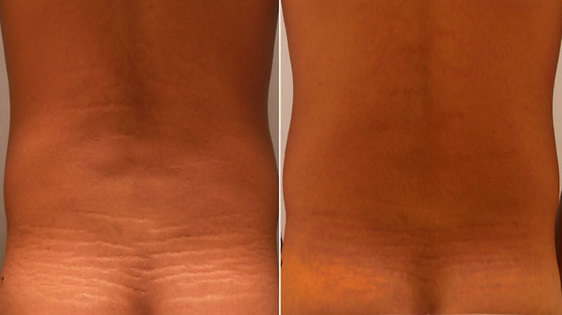 Stretch marks usually occur in areas involving the breast, abdomen, thighs, groins and buttocks. They are initially red or purple, but, as time progress, often lighten. New laser technology allows us for significant improvements compared to past treatment options. Individualized treatment programs will be discussed during your complimentary consultation at Skin Deep Spa. Schedule a complimentary consultation to determine a customized treatment plan for you.